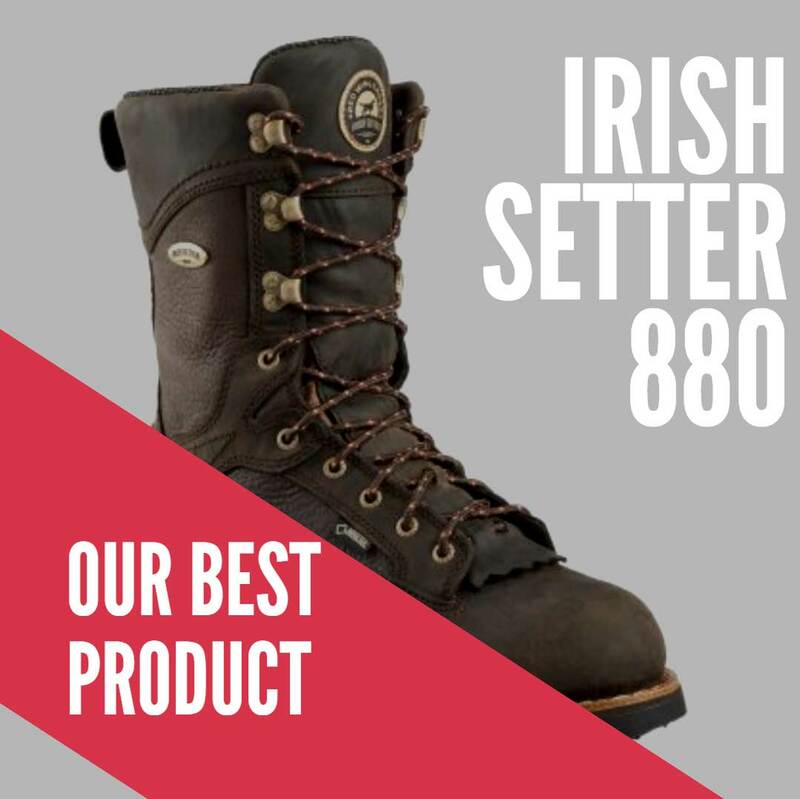 The Irish Setter 880 Elk Tracker are rugged and heavy duty to the core, fitted entirely with durable leather that surrounds the rubber sole. The tread deserves mentioning more than anything else. It will firmly cling to whatever surface you are hiking on, having no incident of slips occurring. 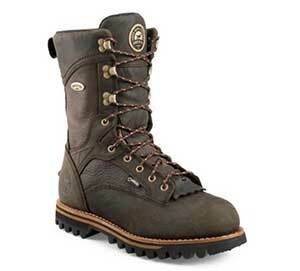 They are a mountaineer (and hunter’s) best friend. The collar is high and keeps all portions of the ankles shielded as well. And the best part is the memory foam sole. For the entirety of your trip, your legs and feet will move and feel as if you’re walking on a carpeted floor. Highly recommended for people that do not sweat excessively. 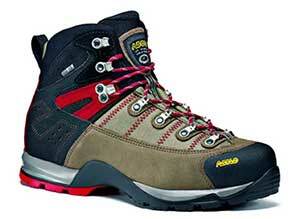 The Asolo Fugitive GTX boots are good for anyone that considers style when looking for foot accessories. It’s sold in four different styles, having laces that stand out. This pair doesn’t have any insulation within the body but still does well at keeping feet relatively warm. You could use them in a cold region but may feel a bit uncomfortable when there’s lots of snow on the ground. The rubber front could peel a little if brushed by a hard surface, even slightly. If won’t break away completely, but isn’t something one would expect to see in a pair of mountain boots. Give them a try if the setbacks mentioned aren’t a major buying factor for you. 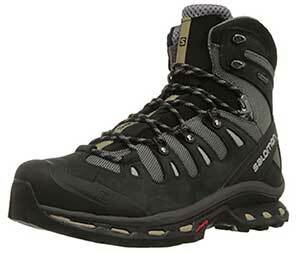 At first glance, the Salomon Quest 4D 2 GTX almost looks like a cross between a high top sneaker and a normal hiking boot, but offer the same as the other products shown in terms of comfort and ease of movement. In fact, break-in becomes a thing of the past with these. You can slip them on and they will immediately conform to your feet, no matter if you’re flat-footed or have a protruding arch. It’s a great boot for anyone expecting to travel with heavy gear for long distances, and won’t strain the ankles in the process. The Lowa Renegade is another lightweight boot with quickly slips on when you’re ready to go out. The fit is good around the toes and arches, providing adequate support but not too much tightness during impact with the surface. Just understand that the sole isn’t removable, so unless you are okay with the padding that’s given, you should probably look at some of this brand’s competitors that have been listed so far. Regardless, it’s a good boot for people that don’t plan on going on multiple hiking or hunting trips over a short time period. 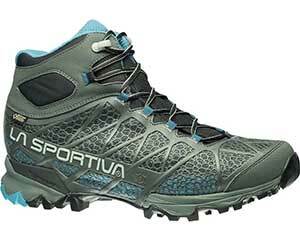 Last on the list is the La Sportiva Core High, a synthetic pair of hiking boots that are easy on the weight but very comfortable, at least when worn for periods that aren’t too prolonged. There is no leather here, and water could end up leaking into the inside if it rains while you have them on. As a result, these are best for climates that are dry or receive little rainfall. But overall, the boots could definitely help for anyone that wants a tread similar to heavier boots, but built with lighter materials around the foot and legs. 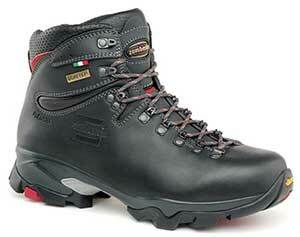 The Zamberlan 996 Vioz GT is a great looking pair of boots that are mostly black, with grey and red highlights. Tread is key here and allows the bottom to slow down movement quickly when traveling downhill on slopes and declines. Its collar is mostly nylon, so sweating is minimal and movement isn’t blocked in any way. But if you tend to go through tread fast (due to peeling), you may want to look at some of the other boots shown, as these could peel easily, something that could be exacerbated if you tend to shuffle when you walk. Still, it’s great for what it does right and looks very stylish on its own right. The Danner Pronghorn is a strikingly beautiful pair of boots with a thick leather exterior that’ll block water from coming inside. If you’re picky about choosing the correct size for your feet, you won’t have to worry about this brand. The dimensions are accurate and should be purchased according to the measurements listed by the manufacturer. Most importantly, you could take them with you to warm or cold climates and not worry about your feet getting too chilly or sorry. Although wearing them with thick socks may make the inside feel a little tight, it’s not a major area of concern and should go away after being worn for a day or two. 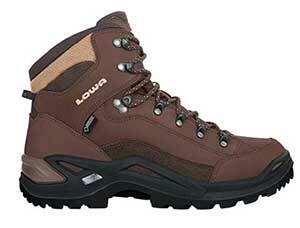 The Lowa Tibet GTX Boots are sold in brown or black, having a smooth leather lining along the exterior. This is waterproof and will prevent moisture from coming inside the feet, even during heavy downpours. Break-in time is very short of nearly nonexistent; your feet will feel right at home from the moment you place them inside. And while the shaft isn’t as tall as some of the other boots are (shown later), they do a brilliant job of protecting your ankles from irritation when your walking long distances on uneven terrain. The Columbia Bugaboot Plus 3 has a 7-inch shaft and is woven from leather and textile. It is the boot for anyone that has a sensitivity to heavy footwear. Although not the lightest, the material keeps the arches and heels flexible without moving around too loosely. The high and low portions of the feet are guarded against impact with tough surfaces, helping to reduce stress when walking through rocky terrain such as gravel. Its temperature rating is also pretty low, so try them out if you hate having cold feet during travel outside. The Danner High Ground 8 is a light brown boot that’s recommended for anyone tends to sweat no matter what type of socks are used. But even if you do sweat in them, they have soles that are built to prevent microbes from developing, lowering the chances of odor and adding longevity to the product overall. Just be careful with the tricky sizing, as they run pretty small in both the length and width. If you are interested in these boots, go at least a half size down more from what you normally would do, especially if you’ve had issues in the past from buying footwear that was too loose. 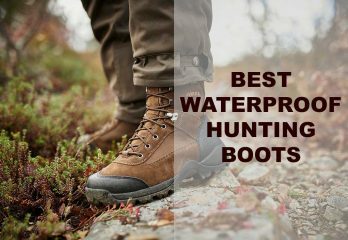 Keeping your feet protected from the ground is very important when it comes to hunting and hiking in the wilderness. 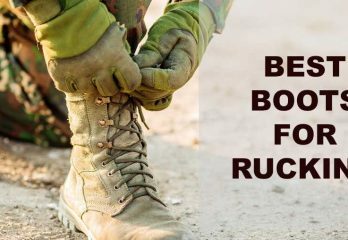 Getting the right boot could save you from not only discomfort but injury as well. Below are great tips and suggestion that you should use before you decide of the set from above that interests you. Of course, you should always stick to what you think is best for your feet, so don’t worry about prioritizing your own personal preferences. If boots are known for one thing, it’s their weight. Because of this attribute, some people are picky about wearing them. But due to the variety of brands that are now manufacturing them, it’s possible to find the footwear in sizes that won’t cause any strain on the feet, even when they’re worn for long occasions. 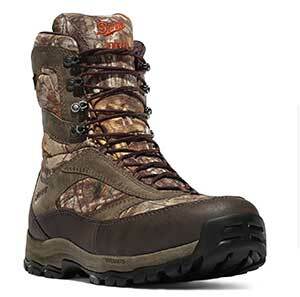 As for hunting, you might be willing to sacrifice weight for comfort in the boot’s interior. But if not, check out the weight that is listed for the brands that get your interest. You might not have to do this though, as most of the lightweight products tend to appear smaller, most notably around the collar and overall height. Laces are an important part of every shoe but are oftentimes forgotten about. You should always check on the quality of the material and thickness with each new pair of shoes you buy, and this goes for boots as well. You don’t want to find a perfect set of footwear only to end up with laces that are low in quality and force you to order strings from a different source separately. Good laces can come in all shapes, but those featured on boots tend to be rounded. It makes the material slip through the holes easier when they are laced up. 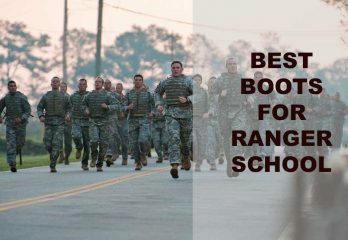 They will always prevent the entire boot from loosening as you walk around in them, holding the tongue firmly in place. Unfortunately, it’s difficult to know exactly with 100 percent certainty whether or not the laces on your boots will perform this way. 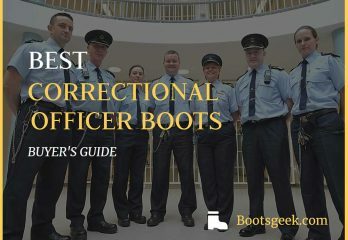 As a general rule of thumb, boots that are made to decrease annoyingly loose movement around the upper foot is usually indicative of such laces included with the footwear itself. 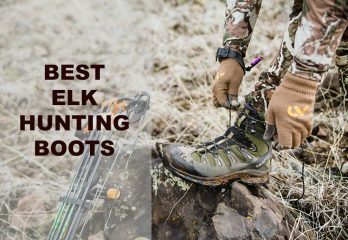 Hunting boots are great for the fact that they can be worn in just about any type of weather, no matter how hot or cold the temperature averages. Of course, people using them in a hot climate will have to deal with hot soles and sweaty feet more often than those in cooler weather, but brands that have perforated sides along the area that’s above the tread can lower the amount of moisture that develops inside. Furthermore, try to have an idea of the terrain that you’ll be walking on before you finalize your pick. 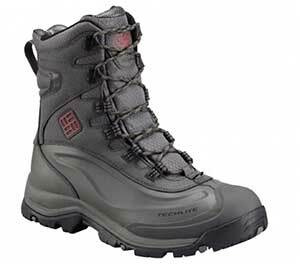 Some boots are better for the rain and mud while others could do wonder for protecting your feet from shrubbery in heavily forested areas. Hunters sometimes must hide out in locations that can be described as such, so boots with a high collar and guarded protection along the ankles would suffice in such a situation. As mentioned, having boots that will help prevent your feet from becoming too sweaty is detrimental to how comfortable you’ll be when they are worn in the outdoors. Temperature ratings are giving to many boots and help indicate how much warmth the foot will feet in the cold. Those with shorter ratings are often the moistest and are generally better for people that do not sweat as easily. As you know, sweat causes bacteria to grow inside the boots, leading to strong odors after the product is worn a couple times. Soles may also have an effect on this, particularly if they have anti-microbial features embedded into the material. It helps lower the bacterial growth which in turn keeps the inside from smelling too strongly of an unpleasant whiff. A boot collar’s height is commonly known as it’s shaft. It is the measurement taken from the base of the shoe’s ankle to the topmost areas along the collar. Both high and low shafts have their advantages and setbacks. As for for the lows, the ankle stays flexible and allow the wearer to run more easily. Many of them are also lighter in weight than their taller counterparts. High collar boots will protect against rain and minimize discomfort along the ankles, as most of them are reinforced to wrap comfortably along the lower leg/upper foot as walking commences. The disadvantage may come when attempting to actually put the boots on or off, along with lowered movement around the ankle. To decide which is best for you, think about the activities you plan on doing when you’re out in the field. If they involve long hikes in moderate-to-warm weather, a lower shaft is suggested. But if you’re in a location with a rugged ground, unpredictable weather, and icy conditions, higher shafts are the way to go. If you’re the type of person that likes to customize your shoes after they have been bought, knowing what type of sole is provided in the boots could help you save money in the long run. That’s because some brands are fitted with pairs that cannot be removed from the boot at all unless done by force. Of course, you don’t want to damage a sole that’s permanently stitched into the rubber tread, so having a set that is removable will be useful if you want to switch out the soles for a more comfortable pair. If the boot manufacturer doesn’t indicate whether or not this is possible, then stick with soles that give the utmost comfort, so that you won’t be affected too much if they are in fact unable to be removed. 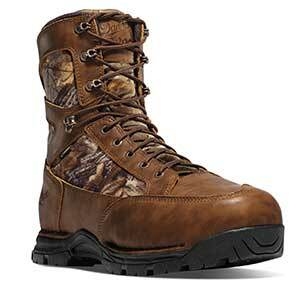 A good pair of hunting boots could last for several years until they need another replacement. Knowing this, you should definitely want a pair that will be able to hold up for at least a year after the initial purchase date. 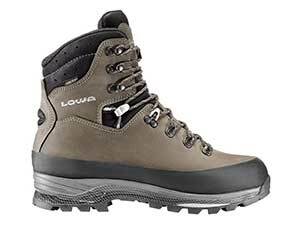 Those reviewed above all have great aspects in their design that make them recommended, but the clear winners are the Lowa Men’s Tibet GTX and Columbia Bugaboot Plus III. Picked for their breathability and strong treads, these will help you stay well guarded against whatever terrain you set your foot upon. For the other products reviewed, they are excellent as well, especially if you’re more concerned about specific features such as shaft height and arch flexibility. 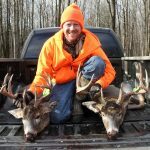 But no matter which pair you have your eyes fixed on, it’s a given your feet will be secured from the harsh obstacles that are synonymous with mountain hunting.